4th Annual Reclaim MLK: This Was Not The Dream! Show up for the the Black Lives Matter Sacramento 4th Annual Reclaim MLK march! 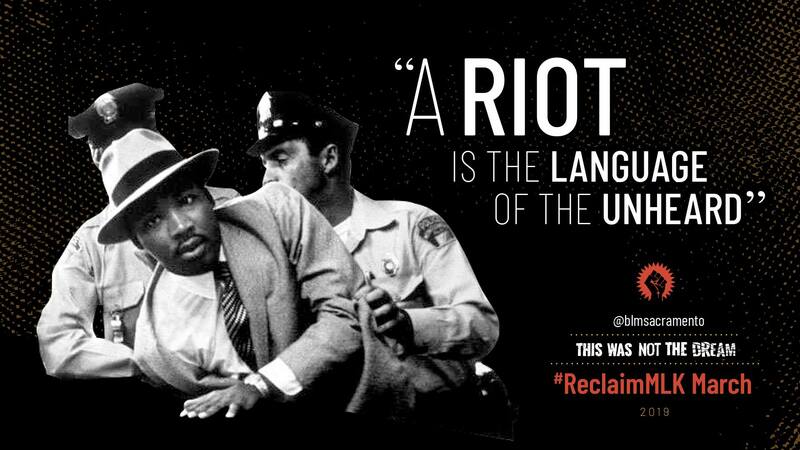 The MLK Jr that doesn’t accommodate the legitimacy of white supremacy, but instead the MLK Jr that tells us that “A Riot is the Language of the Unheard,” that “I’m Black and I’m Beautiful”..
We will not be aligned with any other marches/events tainted in capitalism or sponsored by the very law enforcement entities that are killing us in the street every three months. Instead we march as, and with, the people!